You did it! Harry Wheatcroft in his book strongly recommended crossing Veilchenblau with mauves. I had some OP Veilchenblau seedlings sprout about 4 years ago and lost them all to damping off. I started some again last fall and had a lot sprout but again have lost about half to damping off. They are in pure perlite. I even boiled the water I use on them [using it after it had cooled of course]. I really like Veilchenblau and its smooth canes is one of its big attractions for me plus it does quite well in water logged soil. Once I get my seed sprouting/growing down pat I'll try crossing it. Looking forward to see the flowers on your crosses. 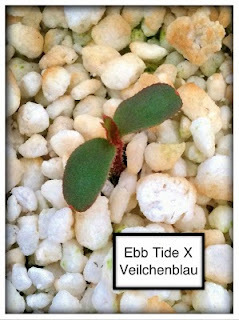 Since I posted this photo, the other cross ('Midnight Blue' X 'Veilchenblau') has been sprouting like the proverbial weeds. I probably have 40 seedlings up already. I think this has much promise! Your excitement is understandable. Veilchenblau is a very interesting rose. Veilchenblau pollen on single bloom of R. virginiana worked well enough to yield five tiny seedlings that have just been potted up. I have no idea of what to expect and I haven't given any thought to where to go with them but I'll repeat the cross this year to get more to choose from.